A lot of my work is about remaining hopeful myself. The future isn't a foregone conclusion. It's really easy to feel defeatist but it's in taking the steps that we write a new path for ourselves. For us ladies at Loam, embodying hope is at the root of everything that we do. We are perpetually searching for stories to share with our beloved readers that inspire action, affirm love, and remind us that change is possible. But that doesn't mean we don't have our moments. We do. We get freaked out by panic-driven reports on climate change and despondent over political inefficacy. Several weeks ago, caught in the throes of a particularly bad bout of blues, I found myself absentmindedly scrolling through Facebook when I stumbled upon a Wavelength profile of Grace Oedel of Dig In Farm. Seeking distraction, I found instead a model for determined activism. Grace is part of a growing legion of badass and brilliant female farmers who are working outside the system to reinvigorate the environmental movement. I connected with Grace over the phone early one Monday morning. 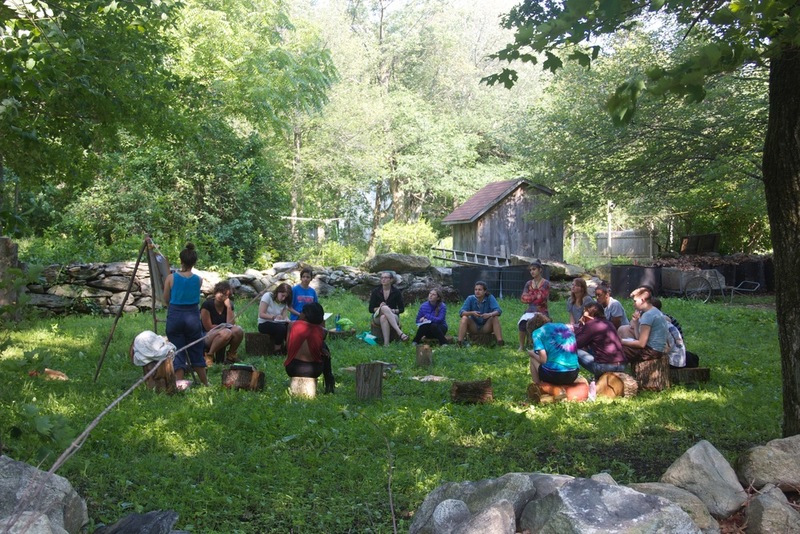 As her newborn son Amos cooed in the background, we talked about permaculture principles, the power of activated hope, and Spiral, Dig In Farm's month-long permaculture intensive for young women. Below, a few highlights from our abridged conversation (thank you Grace, for talking slowly enough that I could write most everything down! I rarely get that luxury during interviews). I hope that Grace's wise words will inspire you as profoundly as they inspired me. KW: How do you bring activated hope into being? When I found permaculture, that changed. It's as equally as important to build a grassroots movement, to build a viable alternative, right alongside this capitalist machine. [Because then you can say] Look! This is what we are asking for and we have already put it in place. KW: So what does it take to do that? GO: We could wait around for a collapse because of climate change or we could do things because they are positive right now. It really improves my life [for example] that there are edible fruit trees planted around the city. That improves air quality for everyone too. And it's much more soul-building for me to say that I want to have strong relationships with my neighbors [and take action based on that want]. It's great to have strong community ties and a local economy— it makes us less dependent on fossil fuels. We want this world now. Little by little, we can build the world we want, and we don't have to do it out of a place of scarcity. I'm really excited about creating a positive view of environmentalism that's about adding value. Because if you come from a place of waiting in fear, you almost set yourself up for a collapse. When you take one good step, it has unknown good benefits. That's a big permaculture principle! I have times myself when I fully take in the sadness or the overwhelm and that can motivate me in a certain way also. It's not the only truth. It's incredibly egotistical to claim to know what's coming when there is so much mystery and so much potential for change. Take a role in authoring whatever comes. We live in a time when we are being asked to have a lot of responsibility [and so] we need to look into the face of what's scary and remain faithful that a positive future is totally available. That's really spiritual work. The bridge between those places is doing and that's what activates my hope. I get so filled up by taking small steps. I see the amazing rebound and resilience of nature when you take on one project. KW: So beautiful! And true. Okay, tell me more about Spiral. GO: 75% of new organic farmers are women. I've spent a lot of time in women's circles [...] and wanted to bring that space into farming. A typical morning is spent half in class, half in nature. We cook lunch in our ramshackle outdoor kitchen and have another shared community dinner and free space in the evening so that people can bring offerings. Last year, our group was particularly interested in issues of race and class. A lot of people brought offerings [which is a] creative space where people can teach classes. We also have optional yoga in the woods in the mornings. One day a week, we'll take a big field trip. We'll study with a local herbalist or maybe spend another day at an urban farming project. Last year, we spent a day at a miso farm learning about fermentation and spirituality. We really do take advantage of the incredible abundance that the [Western Massachusetts] valley has to offer and like to hire our friends to teach. My conversation with Grace reminded me that we don't change our lives in service of the future because the future—whether better or worse than what we can predict— is never a guarantee. We create alternative worlds in this moment because in this moment, it's the opportunity for connection, for co-creation, that nourishes us. So often, I worry that what I do is meaningless because I'm unsure of what impact my small actions—living trash-light, cooking closed-loop—will have on mitigating the climate change catastrophe. I worry I'm not doing enough to tend to the people and places that I desperately love. Dig In Farm beautifully embodies the idea that we don't have to wait to do. And that means we don't have to wait for positive change either. We can create it. We can activate hope. Do what nourishes you. Don't wait. We have the soil and sun and the potential for change. Right now, in this moment.